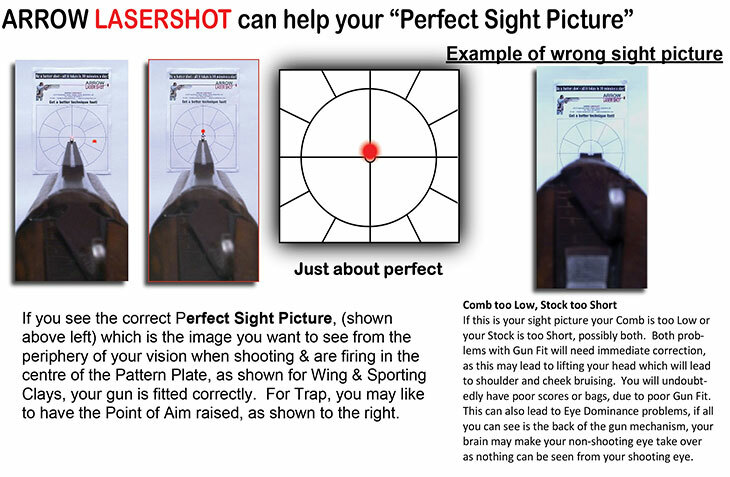 “To improve your shooting, getting the right Gun Fit is one of the most important things you can do” but this is the one thing that people, when buying a gun, will choose to ignore! 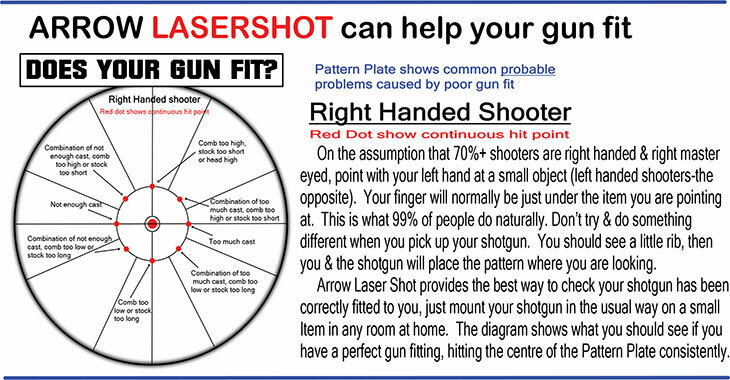 Fortunately, ARROW LASERSHOT can help you achieve the Gun Fit that you need. Getting the right shotgun fit is the first most important element of any aspect of shooting, the first basic principal is that the gun must be pointing where you think it is, this is not just a smart remark, but for a lot of us, to achieve this, it all starts with the fit of the gun. Nearly all the “off the gun rack” guns, are manufactured to suit the average person, whoever that is? average height, average weight, average arm length, average neck length etc. Also, whichever country the gun is manufactured in, the sizes of Mr or Mrs Average may alter. However if you are not Mr or Mrs Average your gun will not fit you correctly & if this is the case, the keywords here are, “FIT THE GUN TO YOU, DO NOT FIT YOU TO THE GUN”. Your Gun Mount must be instinctive, if you have to wrestle with the gun to be able to fire it, not only are you losing time, but you are inevitably going to have a poor irregular gun mount, as a poor Gun Mount could be up to 80% of your misses, the need for a good Gun Fit & a good Gun Mount are essential. This makes the Drop At Comb & the Trigger Pull, the two most important dimensions to get right for a good Gunfit. Shown as items 1 & 3 below. The ideal distance to check you Gunfit is at about 16 yards (16 meters), which is normal pattern plate distance, place an ALS Pattern Plate at your eye height at this range, insert your ARROW LASERSHOT into the top barrel for O/U and either for S/S and place the finger ring on your trigger finger. Raise and mount the gun 10 times to get used to the target you are aiming at without firing the laser, then do the same but firing the laser at each time the gun is mounted correctly (for gun mount see separate section).